Summary: A powerful, uncomfortable affecting piece of cinema. How quickly child stars grow up. Its seems like only yesterday that sweet-faced moppet Joseph Gordon-Levitt was making us laugh on wacky tv comedy Third Rock From The Sun and Michelle Trachtenberg was annoying us on Buffy The Vampire Slayer. And now here they are, snake-hipped and gorgeous, talking trash and far, far worse in Greg Araki’s beautiful, delicate film. Inevitably, because of its subject matter, Mysterious Skin will be compared to films, like The Woodsman, that dare to look at paedophiles as human beings rather than as hideous monsters, but this isn’t really the film’s focus. Neil (Gordon-Levitt) was a precocious kid. We first see him enjoying the attention of Mrs Palm and her five daughters while watching his mother (Shue) and her boyfriend getting down and dirty on his swing. He is eight. Neil’s mum clearly loves her son, but she’s not that interested in him; like many single mothers she struggles to spend enough time with him but she does her best to give him a normal, small town upbringing, including that most American of pastimes, Little League. On his first day at practise, Neil meets tall, charismatic, mustachioed ‘Coach’ (Sage), and falls in love. Ten years later, in the early 1980s, Brian Lackey (Corbet), a bookish, shortsighted teenager, is still troubled by the strange hole in his memories. The summer he was eight, five hours of his life disappeared without a trace. He has become convinced that he was abducted by aliens. An encounter with a fellow abductee in his search for an explanation leads him to Neil, now a cocksure hustler with one thing on his mind, and gradually the pieces of the puzzle come together. Though ostensibly a study of paedophilia, Mysterious Skin is more a look at the effect childhood experiences have on the adults we become. Neil, though appearing perfectly happy, is like Kay in Hans Christian Anderson’s story. His best friend Wendy (Trachtenberg) tells a boy not to get close to Neil – though they are soulmates, she understands that he can’t really love anyone (though she colludes when he abuses other boys). He’s frozen in time, back in that summer when he was ‘special’; his sexuality warped, he is compulsively searching for that same feeling. It’s also a tragic indictment of criminally irresponsible adults. Nothing could have happened to Brian if his parents hadn’t forgotten to pick him up from the game, while Neil’s promiscuous, drunkenly affectionate mum, maybe a bit too keen for some masculine influence in his life, seems perfectly happy to let him spend time alone with ‘Coach’. We never really learn any more about ‘Coach’. He is seen purely from Neil’s perspective and we watch the grooming process in excruciating detail. But for Neil, this is not disturbing until the very end of the film, when, talking to Brian, he is forced to confront his own past. The film is deeply sad and contains scenes that are painful to watch. Neil’s confidence and his belief in his own invulnerability is such that he behaves, like most teenagers, quite stupidly. Which actually leads me to the film’s least believable sequence. Wendy moves to New York and Neil, desperate to get out of their small Kansas town, follows her. Wendy is worried – Aids is everywhere – and she tries to persuade Neil to get a ‘proper’ job. Naturally this involves mundane work in a fast food bar and leads Neil, as always looking for something novel, to make an extremely rash decision. Though the consequences are needed to get Neil to open up, it still seems too contrived that Neil would have walked into the situation with his eyes open – he wasn’t even drunk. 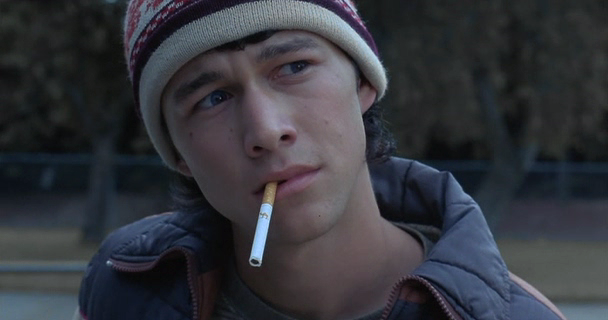 Joseph Gordon-Levitt is simply amazing as Neil, snake hipped hooded eyed and raw, bony teenage sexuality. Brady Corbett, less showy, is equally excellent, and it’s a powerful, uncomfortable affecting piece of cinema.